Second Thursday of the month, and I am happy to have my second Guest Blogger here. She is an amazing swatcher, has beautiful nails, great photography skills, and on top of that she is super humble about it. I greatly admire her frankening abilities as well. I have seen so many beautiful creations on her blog, I really wish she'd sell them one day. The first time I ever saw a duo-chrome holographic made from scratch was on her blog, it blew my mind. She is genuinely nice, her posts are always fun, and the way she writes makes me smile all the time. Here are her pictures and what she wrote. 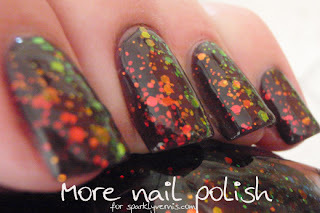 "I was very excited to be invited to guest post over here on Sparkly Vernis. I've followed this blog since almost the very first post, and one of the main things I love about it is the creative and beautiful layering combinations. 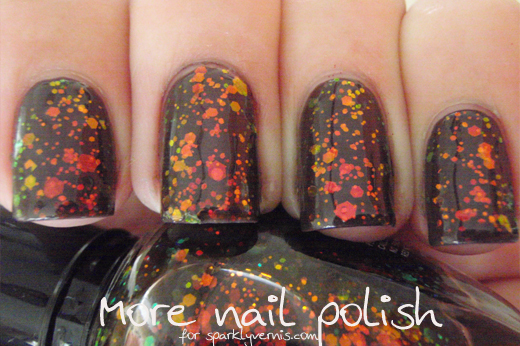 They always inspire me to try layering my polishes in different ways. When I was asked to do this guest post I had to think hard about what I would show, I mean it had to be layering, no doubt about it, but what? I also wanted it to be something from my untireds that I hadn't posted about. I ended up choosing a fantastic polish released last year that is super cheap and generally easily available. Kleancolor Chunky Holo Black. I don't know why I waited so long to try this polish. It is so amazing in the bottle and other than the Ozotic Elytra polishes, I haven't seen any other polishes that contain duochrome glitter. 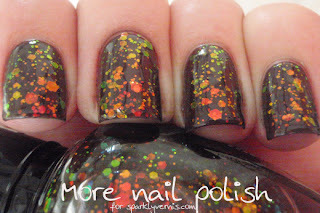 There are lots of duochrome shimmers and flakes, but not many glitters. 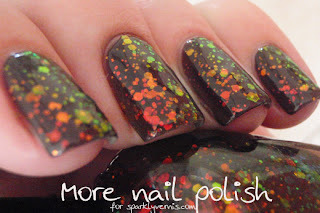 Chunky Holo Black is different from all the other Kleancolor Chunky Holo polishes because it not only has the small duochrome hex glitter that all the others have, it also has medium and large sized duochome hex glitter. 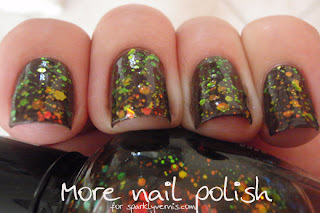 All the glitter in this polish shift from red to yellow to green all in a murky blackish brown jelly base. In the bottle, you can also see the glitter go blue, but I wasn't able to see this on the nail. Here I have layered it over Ulta3 Twilight Fever, which is a near perfect Chanel Paradoxal dupe. I hope you like my layering combo and thanks to Miss Sparkly Vernis for having me!" aaand this will not be an untried for much longer! Hey - that's me! Thanks for having me, and for all the lovely things you said about me! Fantastic! I will be dragging this out the drawer soon! 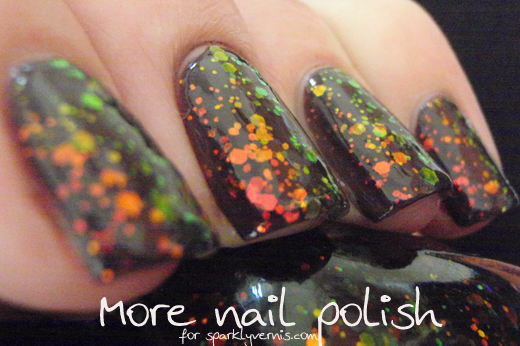 LOVE this Kleancolor so much! It's gorgeous. @ all: thank you for your comments! !